Claire Hunter is counsel at the firm and has a broad civil litigation, public and administrative law and appellate practice. She appears regularly as counsel at both the trial and appellate level, including all levels of court in British Columbia and the Supreme Court of Canada, and before arbitration tribunals and administrative boards. She has broad experience working on complex commercial matters, including conducting internal investigations and has appeared before regulators in Canada, the United States and the United Kingdom. Benchmark Canada recognized Claire as a 'Future Star' in 2015 and a 'Litigation Star' in 2017. 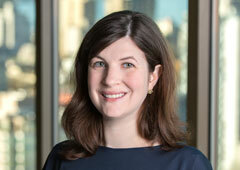 Claire joined the firm in 2010 after five years of practice with Sullivan & Cromwell in New York, where she focussed on defending financial institutions in criminal, regulatory and securities class actions. A graduate of McGill, Stanford and the University of Toronto Faculty of Law, Claire spent a year as law clerk to Justice Iacobucci of the Supreme Court of Canada before commencing her practice in New York. She has been a member of the New York State bar since 2004 and was called to the British Columbia bar in 2010.